In 1892 William Painter patented a simple, but effective design that offered the beverage world consistent reliability for sealing in freshness. 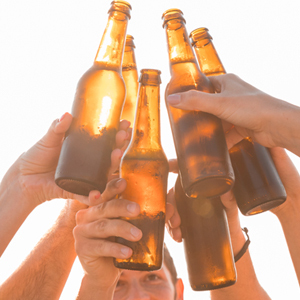 The time trusted combination of a glass bottle, a crown cap and your unique brew and brand, provides your customers with superior beverage freshness and THE JOY OF AN ORIGINAL EXPERIENCE! Crown caps offer a superior seal for your brew. Glass bottles stay colder longer, keeping your carefully crafted beverage chilled and tasting better longer. You have worked hard to develop your brew and your brand. 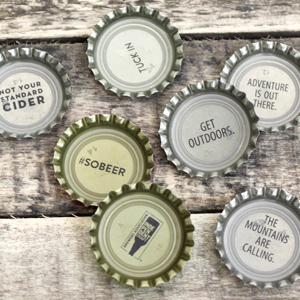 The small space offered on a bottle cap crown is a big opportunity to promote your unique brand and there's nothing quite like a custom bottle cap to let the world know that you've taken your brew to the next level! Our personal account rep and professional in-house designer work with you throughout the custom cap creation process for a superior presentation of your brand. From manufacturing the crown to printing your design, strict standards in our state-of-the-art production process, complete with camera inspection, ensures consistency and quality in every cap. 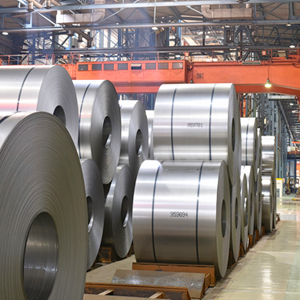 Tin Free Steel is a thin steel sheet coated with a layer of chromium oxide. TFS has a dull stone finish and offers outstanding corrosion resistance. TFS has excellent paint adhesion properties and usually comes with white enamel lacquer applied on top before the final color coat. Tinplate is a thin steel sheet coated with tin. It has an extremely beautiful metallic luster as well as excellent properties in corrosion resistance. Tinplate is used for making all types of containers in the food industry. ETP adds a luxury appearance to bottle caps and is ideal for shinier caps. Shiny silver and golden crown caps are made using ETP steel. 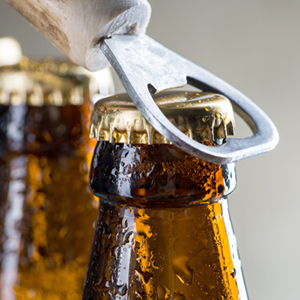 With two secure sealing lips, pry off caps and liners create excellent sealing with the rounded rim of a glass bottle. This is the most popular crown cap liner used today. Twist off liners are softer and have a single lip profile to meet opening torque specs. Twist off is a very popular way to seal your bottle. This liner is similar to the standard liner for pry off caps. The profile on this liner is slightly thicker and has an upgraded barrier from external contamination such as odor or oxygen that might work its way into the glass bottle. Oxygen barrier liners provide extra shelf life. This type of liner absorbs oxygen that is in the bottle neck, decreasing beer or beverage oxidation. Oxygen scavenger liners can provide extra freshness, great taste and extended shelf life. 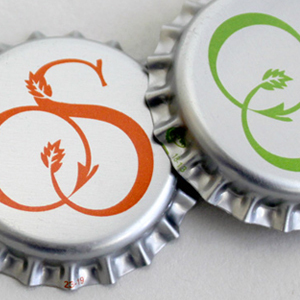 Most colored bottle cap crowns receive a coat of white enamel lacquer on TFS steel. This undercoat provides a base coat and allows the final coat to be bright and glossy. This type of clear primer is used when a metallic appearance is sought after. Transparent primer helps the color coat to adhere to the crown cap. The combination of state-of-the-art offset printing, Pantone color matching and vector artwork produces a crisp, clean custom bottle cap every time. 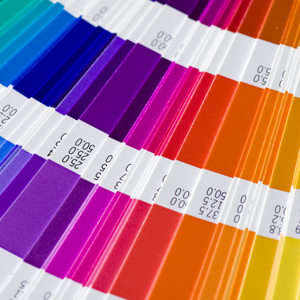 Well over 1,000 precise colors are achieved using the Pantone Matching System. Coated Pantone chips that match your finished bottle cap colors are supplied to our customers whenever necessary to ensure that your custom capped brew will seamlessly enhance your branding efforts. If your artwork does not currently make use of the Pantone Matching System and/or vector artwork, NOT TO WORRY, our designers will effectively work with you and/or your designer to prepare your artwork for print. Almost anything you can imagine can be printed on the surface of your bottle caps using CMYK process printing. This type of printing is used when a cap requires a large number of colors or when the artwork is a photo or an illustration. 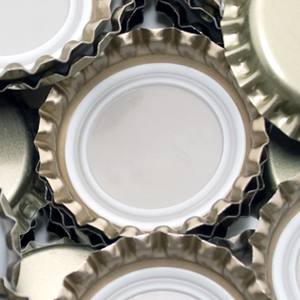 An Internal varnish is used to coat the underside of all bottle cap crowns. This protects the underside of the cap from corrosion and scratching as well as helps in the adhesion of the liner to the cap. 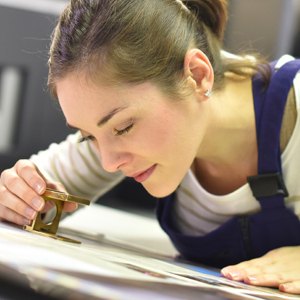 Litho printing makes effective use of the space on the inside of the bottle cap. Clever or humorous marketing, additional branding, promotional contests and more, can be printed on the inside of a custom bottle cap crown. Inkjet printing is used for printing letter or number codes for promotional contests. FDA compliant ink is used in every application.